FAST little boat with water cooled motor and out of water safety function. Great for a pool or lake! Comes ready to run. 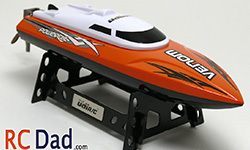 This blazing fast RTR rc boat comes with high quality components and delivers impressive performance for less than $170! One of the smallest RC Boats with the speed and features of boat that cost twice as much!